Wonderchef takes off! Last Friday, Croma, the large-format, multi-brand consumer durables and electronics chain from the House of Tatas, announced a tie-up with Wonderchef, to promote healthy, tasty and convenient cooking amongst Indian housewives. As I have told you Wonderchef brings to Indian homemakers a unique range of cookware, kitchen tools and accessories carefully handpicked by me from all over the world. I have chosen these products for their unique space saving features, low oil consumption and best quality. We are also giving an opportunity to Indian housewives to learn healthy, tasty recipes from Wonderchef shows held exclusively at Croma stores. We hope to empower the Indian woman by enabling her to create a business of her own, boosting her pride and household income. We had a press meet and there it was announced that Wonderchef will be marketed, positioned and sold exclusively via Croma so that Wonderchef derives tremendous mileage out of Croma’s rapidly growing customer base. Wonderchef is being launched at Croma stores in Mumbai initially (Juhu, Bandra, Ghatkopar and Malad) and will be rolled across India, over a short period of time. We were having this little discussion over the lunch table today about how things are easier for non-vegetarians than the vegetarians when they go abroad for short stints, either on holiday or business. Well, if you are on holiday with a planned tour, of course the tour company will provide you with food that will be easy for you: especially when Jains travel, they do make it a point to go with a tour company that will provide them Jain meals. I know of business executives who travel with ready to cook packets of dals and sabzis and complement them with store bought bread. In fact, there is a downside here. When one travels abroad, one major part of the experience is the food! The local cuisine, a taste of the national favourites, a cup of coffee at the bistro, a giant burger in a US McDonalds, a fillet of smoked salmon in Tallin, what have you. 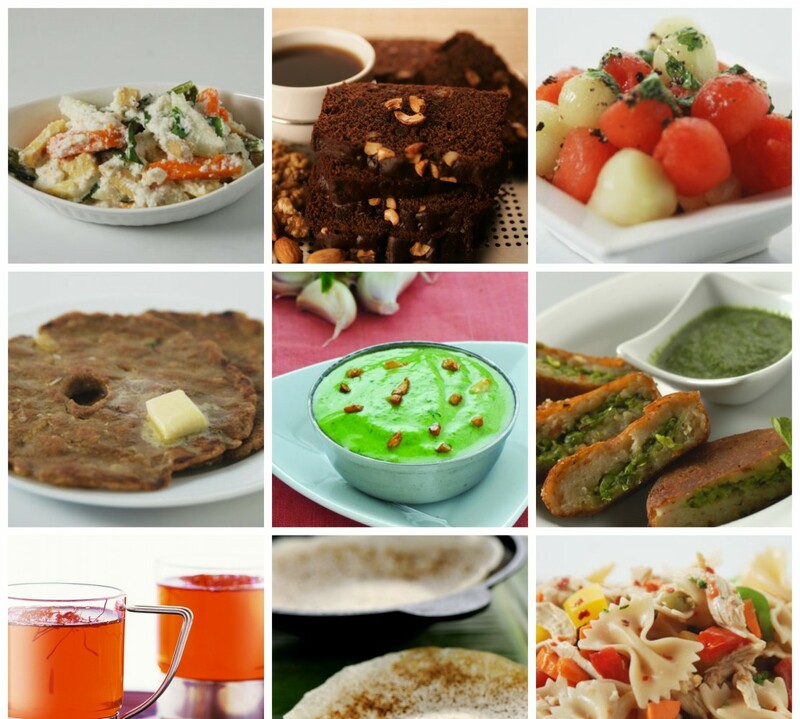 Or if you are a strict vegetarian then do research before hand and try out the local vegetarian delights. I remember some time back in Hong Kong, we had some friends with us who are vegetarians. They ordered steamed rice and a tofu preparation. That is a good meal! And ended it with loads of china grass pudding. So when in Rome, do as Romans do, and also ensure that the fun of the holiday is not marred by a lack of tasty nutritious meals. Even has the rains come hard on parched Mumbai, the day simply rolls out into the night even faster than before…how time flies! These are the days of traffic jams, potholes masked as small treacherous muddy pools in the middle of the road, and the daily suspense – if schools will be let out early! And then, food keeps becoming larger in my life! Just back from Singapore – had been there to try out the new recipes for the Shahi Thali for Singapore Airlines. I have been on their panel for over three years now. What are we creating? To name just a few, Paneer Tulsi Malai, Nadru Rogani, Orange Chenna Payesh Stuffed Profiteroles – the new flavours of the season for the seasoned travellers who are always looking forward to new foods on every flight. Have a new book on the anvil called Food for Fussy Kids and this is one book that I would love you to make! Check out the invitation on the website for pix and recipes and let us, you and I and my team, come up with a cheery, helpful book that could stop a lot of young mothers from developing grey hair by easing their problem of feeding fussy children. I do look forward to some great creative interaction and contributions from you! Budget Day and I am in the Capital. Just a coincidence. People may call it a lacklustre budget but according to me, things are status quo – it is a aam aadmi ka budget. No points on food industry and lots to do with farmers, female education, employment guarantee scheme for rural youth and a tremendous boost for infrastructure like highways, telecom and airports. Mumbai gets an increased budget for its storm water drainage project to avoid floods. The Policy on National Food security will give all BPL families 25 kg rice per month at Rs 3/kg. There is going to more housing for poor, a step towards a slum-free India. And yes, remote places will also have banks. Going to urban India, for those who are city based salaried and business dwellers, Saral 2 would be simple. The tax exemption limit for senior citizens and women has been raised, albeit marginally. Enhanced allocation to education sector with 450 crores for new IITs. Public sector disinvestment – 51% equity to remain with government, rest will go to public. Let us see the brighter side of things. This too shall pass and the next budget will come with its promises.